Shelby Miller and Joe Kelly, Jr. of the St. Louis Cardinals answer questions during the Cardinals Caravan appearance at Hammons Field in Springfield. 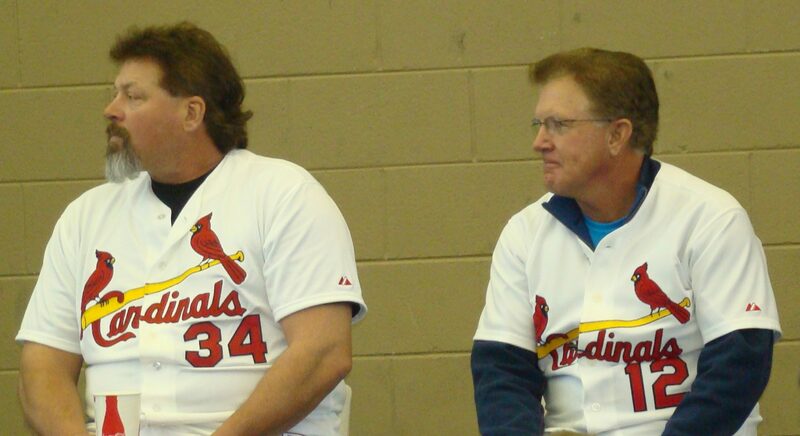 Danny Cox and Tom Lawless answer questions from the fans as the Cardinals Caravan hits Springfield. 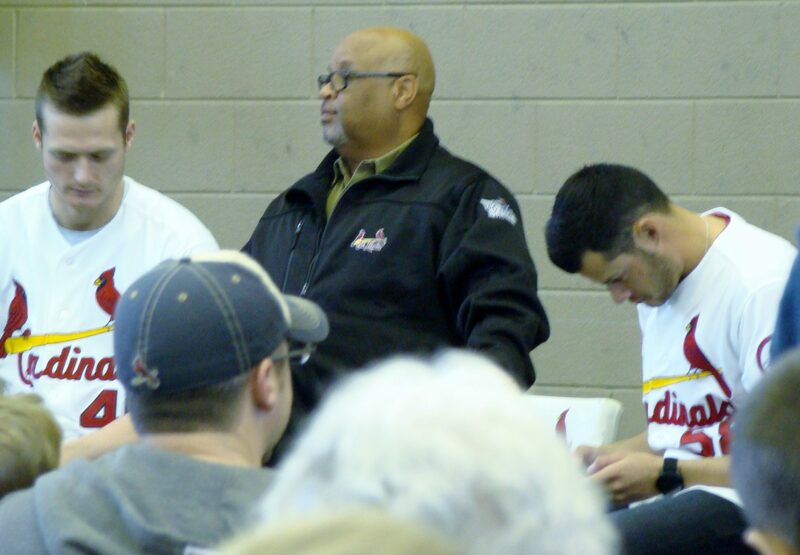 Once again the Cardinals Caravan arrived in Springfield yesterday, bringing Joe Kelly and Shelby Miller back to town along with Tom Lawless, Danny Cox and Mike Claiborne who served as host for the event. Heading into the Springfield Cardinals 10th season, the organization brought Springfield fans a little something to keep them smiling through the off-season as a host of dedicated followers from around the area attended yesterday’s event inside the Springfield training facility. The Caravan ended their visit by making an appearance at the Bass Pro Tournament of Champions. This year as in years past, the proceeds benefitted the Children’s Miracle Network. Cardinals Caravan is a great way for the St. Louis players, especially the ones who have spent time in Springfield, to return to the community. The daytime crowds are generally small compared to game day activities during the regular season. This is a chance for the devoted Cardinals fan to get a more personal glimpse at the players they cheer for all season. There was even a question and answer session where audience members young and old were allowed to ask questions, which was of course followed by autographs for the kids. Opportunity–Spending time with some of your favorite Cardinals personalities including Kelly and Miller. Springfield loved both of them as minor leaguers and we’re always proud to see them come back to town. Joe Kelly is still a fan favorite perhaps because even as a big-leaguer he’s willing to do the worm at the honest request of a young fan. Yes, he did the worm dance. Honest Concern– The first question was a direct hit about the ethics of Peralta. We love this team; we’re proud of it. We want to feel good about where we send our players, especially the very young and impressionable ones who are just trying to make it to St. Louis. We want clarity on the position of the organization. Give the guy a chance? Thoughtful Questions–The question answer session included great questions such as “Who would be the toughest hitter ever to face as a pitcher?” and “What is your best baseball memory?” which were both asked by children. Miller answered Barry Bonds, with Kelly answering Ken Griffey, Jr. to the first question. Interesting that no current players were mentioned. Less Media Savvy Answers–Such as Shelby Miller admitting that when he was a kid he wanted to be an Astro as he grew up in Texas. Subtle Innuendo–As implied between Miller and Kelly when asked why Miller sat out during the series. From the look on his face you just had to trust that Dad (Matheny) knew best and he sat him for a reason. As an adult who works with high school athletes, I have my logical guesses, I’m going to trust Coach on this one. Simple and Sweet–For example, Joe Kelly talking about the aforementioned Griffey Jr. being his favorite player when he was growing up, or reflecting on playing against Steven Strasbourg in a 12 and under Cooperstown National Tournament, or Miller talking about the day he got called up and remembering the exact day being June 9th. Just Don’t Get This in the Big Leagues Moment –A Bass Pro Tournament of Champions Miller and Kelly face-off for three-point champion, the winner of which is still being disputed on Twitter. Great Memories–Remembering Danny Cox and Tom Lawless from the ’87 series against the Kirby Puckett-Kent Hrbek version of the Minnesota Twins (talk about players you wouldn’t want to face). Rewind your memory to game 4, tie game, Lawless hits a 3-run homer off of Frank Viola and led the Cards to a 7-2 win. Forward to the next day, a Game 5 victory led by the amazing pitching of one Magnum PI mustached Danny Cox who lead the Cardinals to a 4-2 win and gave the Redbirds a 3-2 advantage in the series. We thought we had it. (Sounds eerily familiar). Those Moments–That smile and sparkle that you still recognize as you listen to Cox talk about getting the call to play for Whitey Herzog’s Cardinals. What It’s All About–The child-like respect and admiration from young and old for those who have played the game at it’s highest level. The love for this game transcends so many barriers. Overall, being a minor league fan is a special thing and in Springfield, we believe it when someone like Mike Claiborne tells us we’re part of the best minor league organization in sports. We’re proud of how we support this team and we love when players come back to town and we love that we get to share moments with just a few hundred instead of 40,000. It validates why we go to the ballpark, why we memorize stats and why we stay just a little longer even though we have to get up and go to work in the morning. We expect players to appreciate the fans that loved them first, we remember who doesn’t show up or who “big times” us on a rehab assignment. Perhaps Lawless said it best when he described baseball as “just being part of our lives”. He was talking about being a player, but it’s the same for the fan. It’s just a part of our lives and our community, especially in the minors and in a way that only those of us who share this love can understand. Thanks Joe Kelly, Shelby Miller, Danny Cox and Tom Lawless for another amazing year with the Cardinals Caravan. DeAnn Short is a wife, mother of two boys, educator and high school counselor. Born and raised in Springfield, MO, she still resides in the Southwest part of the state. She earned both her Bachelor's and Master's degrees from Missouri State University. She is a devoted sports fan, proud citizen of Cardinal nation and self-proclaimed minor league aficionado. She also writes a blog called Raising Johnny Ballgame in which she combines two of her loves, her boys and sports. Her favorite place to be-- on the river or at the ballpark, any ballpark. Leaving Cardinal Nation…for the Windy City?